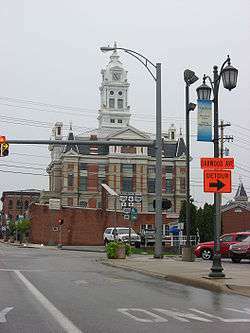 Motto: "Heartland Values, Flowing Opportunities"
Napoleon is a city in and the county seat of Henry County, Ohio, United States, along the Maumee River. 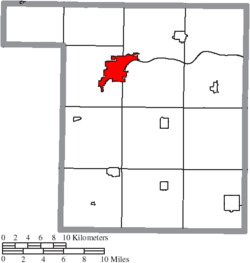 As of the 2010 census, the city had a total population of 8,749. In the city the population was spread out with 25.9% under the age of 18, 8.9% from 18 to 24, 28.2% from 25 to 44, 20.9% from 45 to 64, and 16.1% who were 65 years of age or older. The median age was 36 years. For every 100 females there were 89.7 males. For every 100 females age 18 and over, there were 84.8 males. Napoleon's economy is based on the manufacturing of a variety of goods. A major employer is the world's largest Campbell's Soup Company plant, located on the southeastern end of the city; also Tenneco owns one their largest Elastomer Plants there. 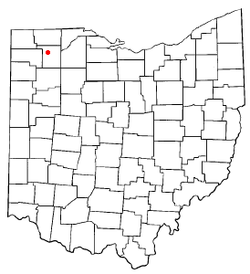 Napoleon is also home to the Northwest Ohio Technology Society. 1 2 “The American Town: A Self-Portrait; Napoleon, Ohio” 29:44, 1967-01-26, University of Maryland, American Archive of Public Broadcasting (WGBH and the Library of Congress), Boston, MA and Washington, DC, accessed September 21, 2016. Online access in the US only. ↑ "History of Henry County". 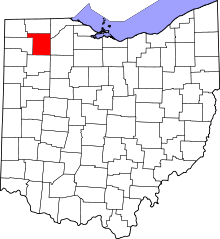 Henry County Ohio History. Retrieved 24 March 2015. ↑ "Napoleon, Ohio". Ohio History Central. Retrieved 24 March 2015. ↑ "Population of Civil Divisions Less than Counties" (PDF). Statistics of the Population of the United States at the Tenth Census. U.S. Census Bureau. Retrieved 28 November 2013.